Introduction: The Savings of Size? Does Big or Small Grow Fastest? For nearly a century, it’s been considered conventional wisdom that larger-scale power generation means lower-cost electricity. This wisdom is built on two basic theories of economies of scale. First, there’s the simple fact that larger volume components of power plants provide more usable space than the related materials costs. This simple illustration explains. 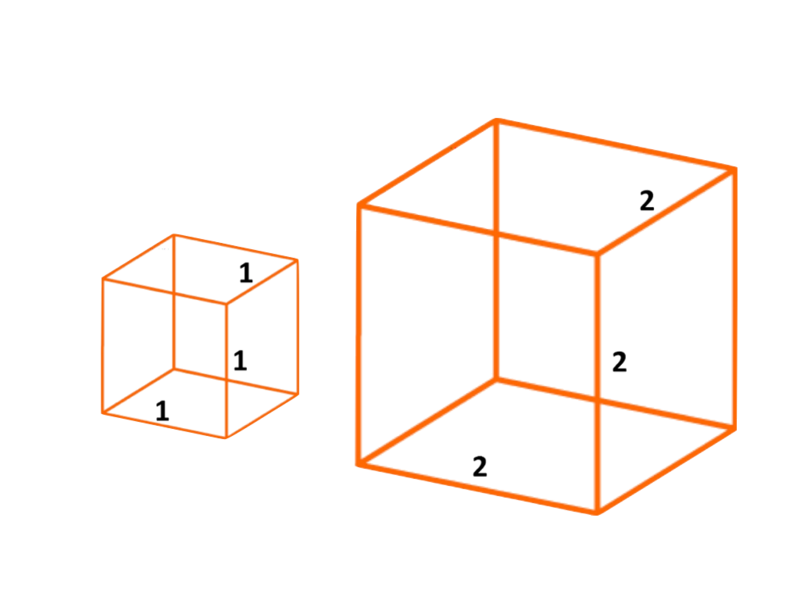 The box on the left has a volume of 1x1x1 = 1 cubic foot. To assemble the box, you need 6 square pieces of material, each with an area of 1, for a total of 6 square feet. The box on the right has a volume of 2x2x2 = 8 cubic feet. The larger box can be assembled of 6 square pieces, each with an area of 2×2 = 4 square feet, for a total of 24 square feet. We’ve increase the volume of our container 8-fold, with only a 4-fold increase in material costs. As power plants became bigger in the first half of the 20th century, they captures this economy of scale in materials. The second basic theory is that the average cost of a product decreases the more you make of it. This takes into account the scale economies in material costs (in building the factories), but also the notion that some overhead costs (such as annual registration fees, insurance, etc) are fixed or grow more slowly than the total output of a business. Both of these theories were well supported by data in the early years of electricity generation in the 1900s, with coal, oil, and then nuclear power plants producing lower cost power from larger sized plants. The advantage to size also lent credence to the conventional wisdom of monopoly utilities. Big power plants required large amounts of capital, and capital markets offered lower interest rates to companies that did not have the risk of competition for their ever­-larger power plants. But after decades of success, the “bigger-is­-better” mantra stopped generating returns on investment, nearly 50 years ago. In super­-large fossil fuel power plants, specialized equipment required excessively high temperatures and special materials that were more expensive than the marginal gains in efficiency. 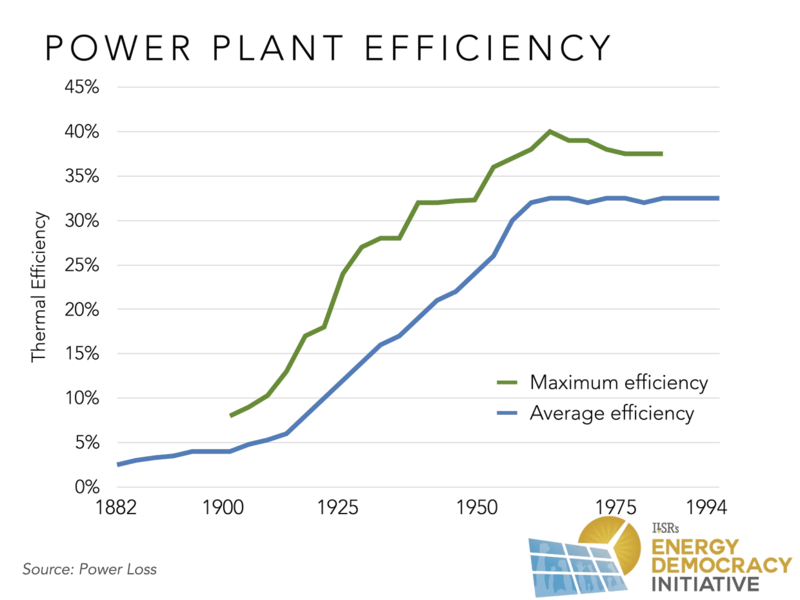 This graphic, from a book called Power Loss, illustrates the plateauing of power plant efficiency in the mid­1960s, as challenges in operating giant power plants offset their economies of scale. The plateau in plant efficiency from technical challenges was accompanied by a leveling off in the cost reductions of building bigger. Bigger power plants, evidence suggested, incurred higher indirect costs, such as much longer construction time. In the 1970s in particular, high inflation and other factors made up as much as 60% of a power plant’s cost, and made delay costly. Despite the evidence about limits to scale economies, the conventional wisdom that bigger is better has persisted into the renewable energy power industry. It’s particularly ironic, since the costly ever­-bigger power plants of the 1970s led Congress to pass the 1978 Public Utility Regulatory Policies Act (PURPA), the federal law that opened the door to renewable energy alternatives to conventional power plants. This lesson seems lost on many observers of the renewable energy industry. The first is similar, that larger solar or wind power plants will produce less costly power than smaller ones, given a similar level of sunshine or wind. 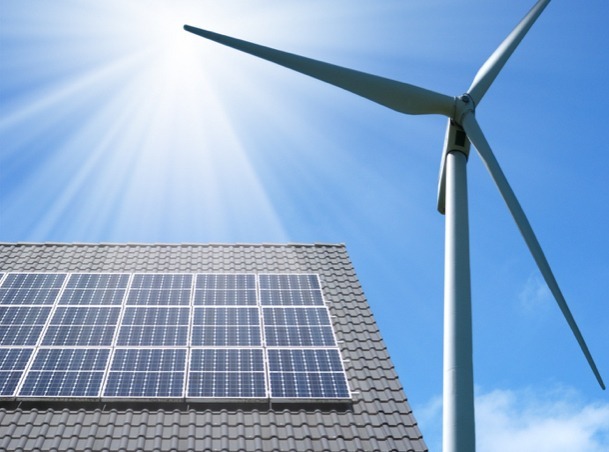 The second suggests that renewable electricity is best produced in areas of the highest resource quality, and then transmitted long-distance to users. The third is an assertion that the road to the most renewable energy the most quickly is via the largest power plants. In 2008, New York Times reporter Matthew Wald hit all three of these assumptions. He suggested that the major barrier to expanding the nation’s wind power was lack of transmission capacity. To tap the country’s wind resources required building vast wind power projects in the windy Midwest and then shipping that power to population centers on the coasts, argued Wald (and others). In the same article, Wald described “immense solar­-power stations in the nation’s deserts,” a reference to concentrating solar thermal power plants that focus sunlight with hundreds of mirrors to generate heat, then steam, then electricity. Like Wald, many observers thought that the quickest way to mass deployment of solar energy was building out many of these multi­-hundred­-megawatt facilities in the world’s deserts, then shipping that electricity via new transmission lines back to population centers. 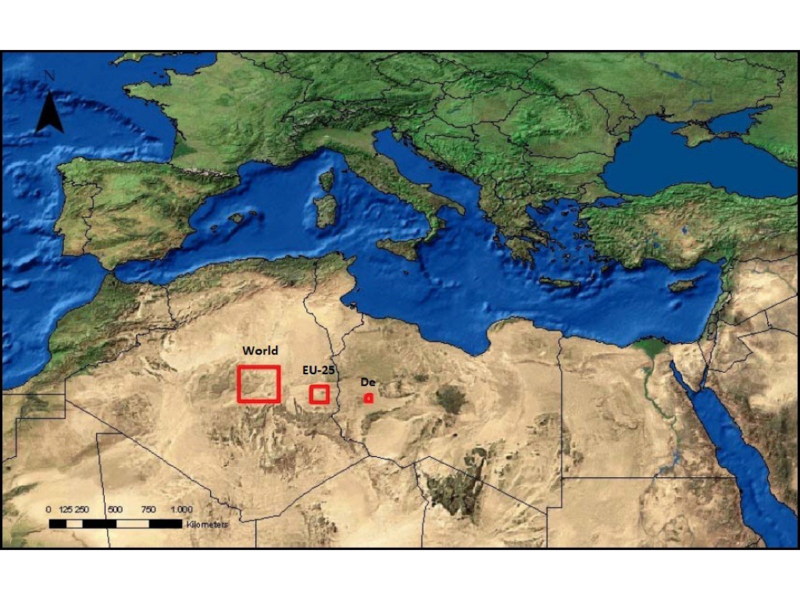 One initiative, called Desertec, even proposed to power all of Europe with concentrating solar thermal power plants in the North African desert. The adjacent image was circulated widely at the time, with the red squares representing the areas that could be covered with reflective mirrors to generate enough electricity to power the entire world, the EU­25, or Germany. The arguments over scale have continued. Investor­-owned utility Xcel Energy released a video in 2015 decrying “thinking small” in favor of “large scale solar projects that deliver energy more economically.” Just last year, a Brattle Group study suggested that utility­-scale solar power plants were much less costly than distributed ones. These are just two shots fired in a larger battle over the size and scale of renewable energy deployment. The managers of electric utilities eventually realized there were limits to scale economies of fossil fuel power plants, in part because smaller­-scale cogeneration and renewable energy power plants allowed under PURPA undercut the utility’s electricity costs. In renewable energy, the main issue is whether large, custom­-built wind and solar projects can compete with small, mass­-produced ones, when the former require access to big, expensive infrastructure that the latter do not. To address the economies of scale question for wind power, we have to address the scale economies of a single turbine, a group of turbines (called a wind farm or wind project), and whether it’s better to chase the best resource or build (at smaller scale) close to demand. In a 2007 report, ILSR detailed the significant benefits of these changes (shown in the graphic to the right). 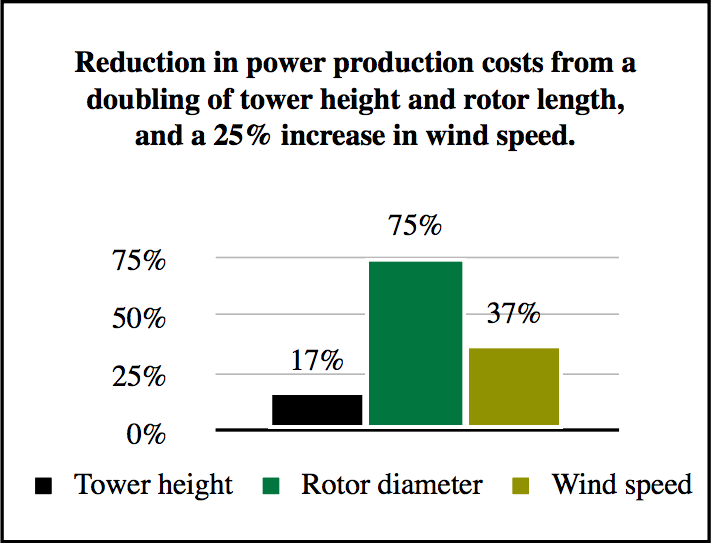 Doubling the height of a wind turbine can reduce the cost of electricity it produces by 17%; doubling the size of the rotors can do even more, reducing the power cost by 75%. Although average turbine height seems to have leveled off near 80 meters, there’s little sign the the scale economies of a single turbine have reached their limits. Data from the 2015 Wind Technologies Market Report shows a steady increase rotor length and rated capacity, allowing individual wind turbines to produce more electricity. In other words, there are clear economies of scale in the size of a single wind turbine. 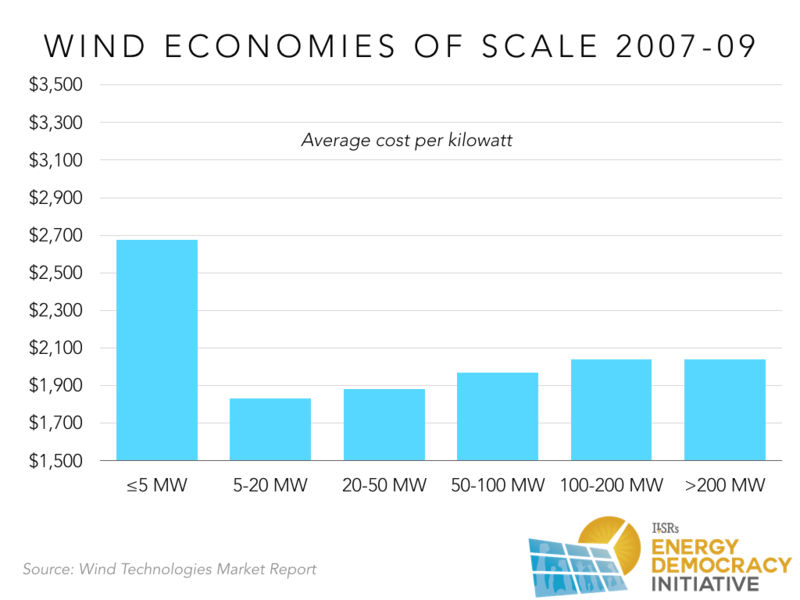 Given these scale economies, the next question is whether large wind farms or smaller ones make economic sense. Based on data released in 2010, the conventional wisdom seemed shattered. Wind projects installed in 2007­-09 actually exhibited dis­-economies of scale, with larger projects costing more than projects sized between 5 and 20 megawatts (using 3 to 12 average­-sized turbines). The 2010 data seems to be an aberration, as subsequent data aligns with the conventional wisdom of scale economies. One potential difference is that many regional transmission operators adopted cost­-sharing provisions around 2010-­11 that lifted the burden of transmission expansion from individual project developers and allowed it to be shared among all electric customers in the region. Since larger projects would have been more likely to incur transmission upgrades, it may explain at least part of the higher costs for larger projects. 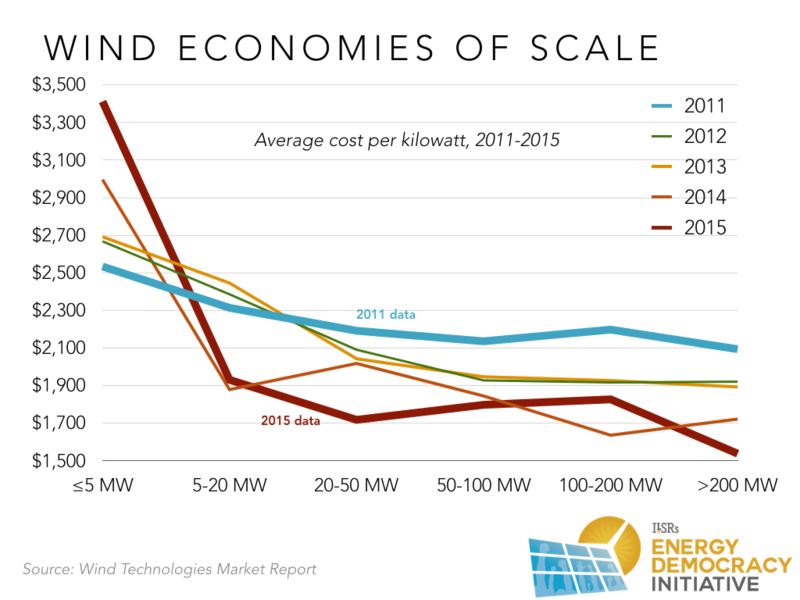 The following chart shows the recent economies of scale data for wind farms by size, highlighting 2011 and 2015 data. 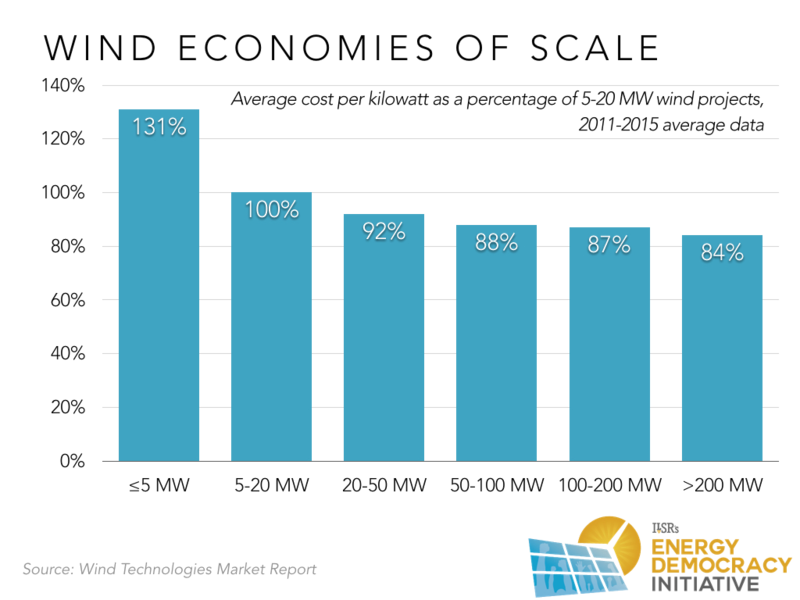 It’s clear that scale economies have increased substantially at the breakpoint of 5 megawatts, with the smallest projects nearly double the per­-kilowatt cost of ones 5 megawatts and larger. Although the five lines above show the gradual increase in economies of scale of larger wind farms, combining the lines into a five­-year average is also instructive. 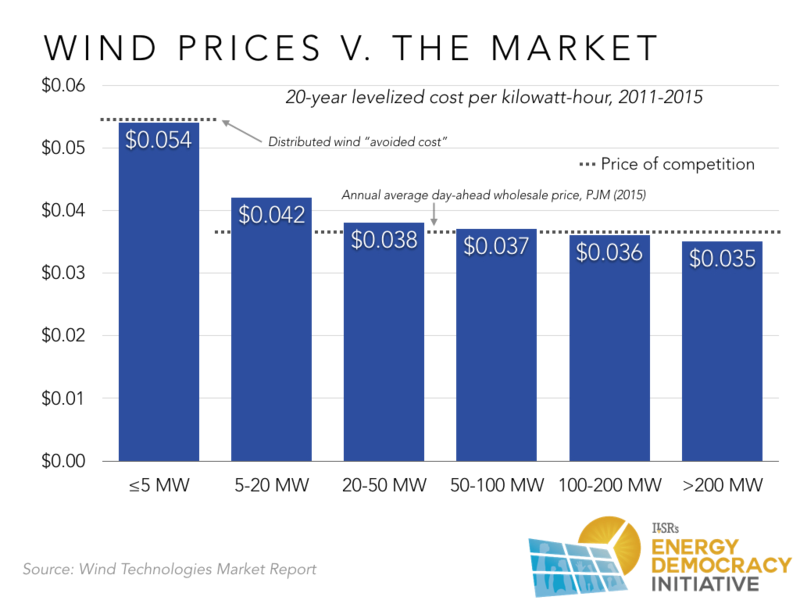 The chart below shows the cost per kilowatt for wind farms of increasing size as a percentage of projects sized 5 to 20 megawatts. The lesson is that two­-thirds of the economies of scale of wind farms is captured when projects exceed 5 megawatts of total capacity. There are two caveats about data showing lower prices for larger projects: the price of competition and the cost of transmission. While nearly all commercial scale wind projects sell electricity into the grid, the smallest projects may be competing against a different price than the larger ones. There’s some evidence from community­-scale developers that the fair contract price for electricity for projects under 5 megawatts that connect near utility substations (receiving the “avoided cost” utilities are required to pay under PURPA) may be much higher than grid wholesale prices because it avoids both generation and transmission costs.1 The following chart (converting the costs per kilowatt above into a 20­-year price of electricity) illustrates how this avoided cost is much higher than the wholesale market price, sometimes called the “day­-ahead locational marginal price.” It means that even the smallest wind power projects can be cost­-effective. This value advantage of small projects may be an opening for community­-based wind projects that have previously been seen as uneconomical in comparison to large­-scale ones. However, “community shared wind” has yet to enjoy the popularity of community shared solar, as noted in ILSR’s 2016 report. The second caveat about the advantages of scale is the issue of costs to transmit power to customers. 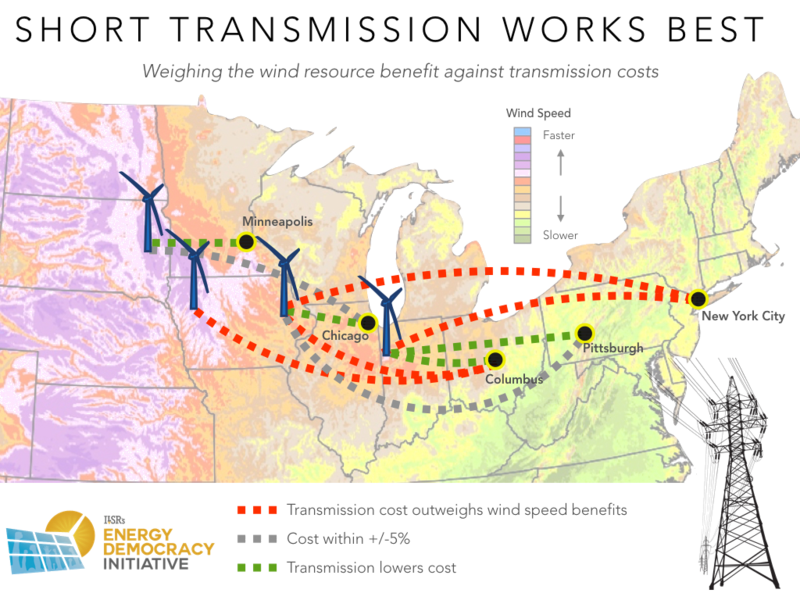 All of the costs shown in the above charts include interconnection to the electric grid, but may not include costs to upgrade the transmission system to accommodate the new capacity. Larger projects are more likely to incur these system upgrade costs, which are typically spread among all electric customers. Therefore, it’s hard to disaggregate transmission costs and get an accurate picture of whether the largest wind projects are truly the most economical. So individual turbines show clear economies of scale, but with wind projects the data is less clear. In the third economies of scale issue, of wind farm size and distance from the best wind resources, the data is also muddled. The windiest and most remote sites likely have the greatest amount of space for new wind projects, whereas projects sited close to consumers may have to be smaller. In ILSR’s 2007 report on wind economies of scale, we examined this issue and concluded that the cost of transmission can consume the advantage of building larger in a better wind resource. 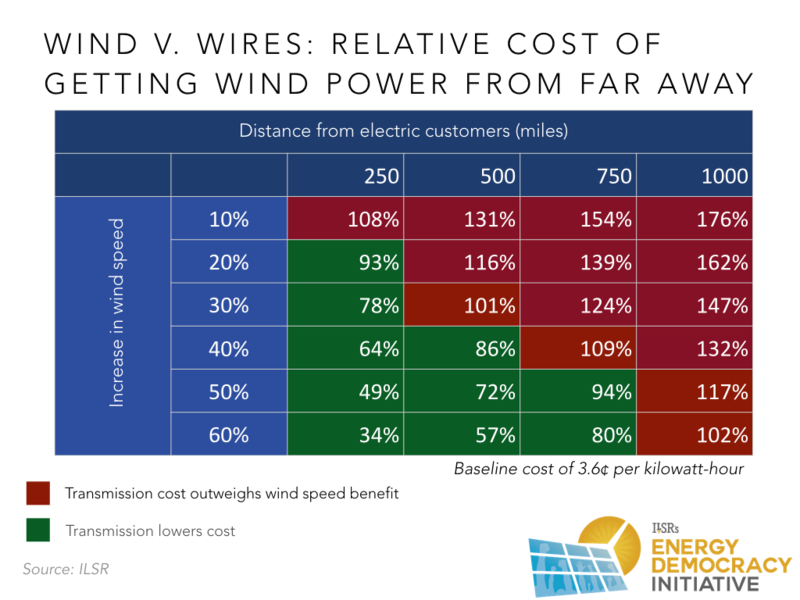 The following table provides some illustrations, with values in green showing wind speed increases that can offset transmission costs, and red values showing where the cost to transmit outweigh wind resource benefits (assuming a similarly sized wind power project). To get a sense of how these calculations play out in the real world, the following map shows that many large cities could benefit from getting electricity from wind farms within 400 miles, but that longer distances cannibalize the savings of higher wind speeds. For this map, we assumed that projects proximate to the city would be smaller (between 100 and 200 megawatts) and produce electricity that was more costly by about 3.5%. The issue of transmission infrastructure is complicated by the fact that transmission planning tends to lack transparency and access for local communities, and a serious consideration of alternatives. While the largest wind power projects may have a marginal price advantage, it’s also true that big wind farms, unlike smaller ones, aren’t compatible with ownership structures that deliver greater economic benefits to the local community. Since sub­-5­-megawatt wind projects may be able to compete at a different price point, having community ownership may prove more economically lucrative (even with a slightly higher electricity price) than purchasing power from a remote wind farm. There’s a clear economy of scale in the size of individual wind turbines and the construction of wind farms. However, the issue of energy transmission complicates the analysis. Given the process and cost-­sharing elements of transmission planning, it’s difficult to disaggregate these effects. There may also be benefits to the smallest wind (and solar) projects being able to access higher contract prices that may make these community­-scale projects more competitive. 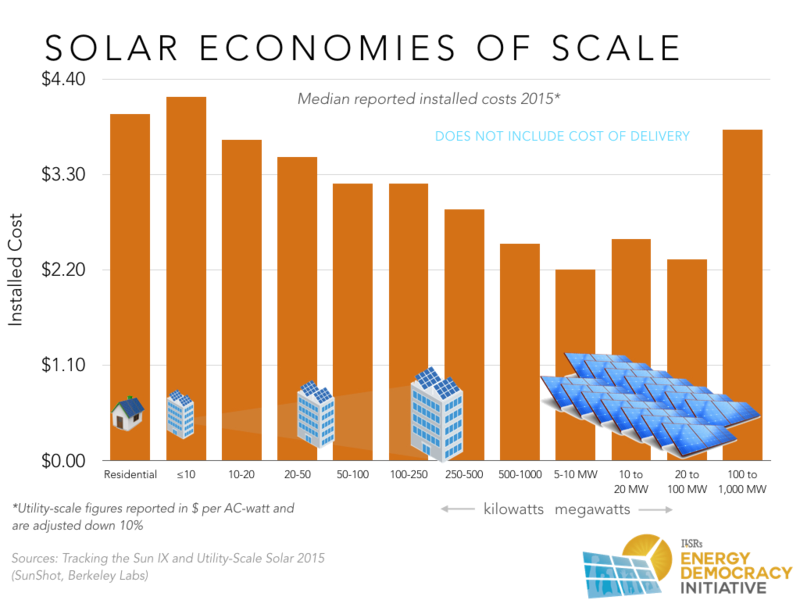 The question of scale economies in solar has been both a technological and an economic one. As mentioned before, the contention in the late 2000s was that concentrating solar thermal power plant technology would outstrip solar photovoltaics (PV) because the latter was marginally more efficient (at the point of generation) and could incorporate energy storage. Frequently left out of that argument were the cost and loss of energy in transmission. In 2010 comments to the California Public Utilities Commission on the now­-constructed Ivanpah concentrating solar power plant (called the Genesis Solar Energy Project at the time), transmission and generation expert Bill Powers explained that the cost of electricity from Ivanpah was likely to be higher than from distributed solar PV. It’s also worth noting that the higher output from a concentrating solar thermal power plant is in part due to the use of natural gas to ramp up plant output in the morning. The Ivanpah facility consumed nearly 744,000 thousand cubic feet of natural gas in 2014, about what 8,400 Minnesota homes use in a year. 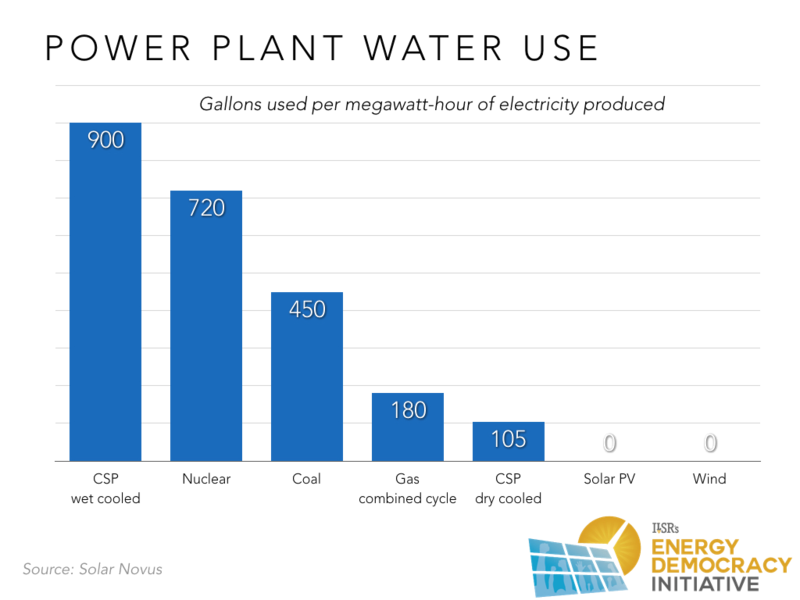 Another, often overlooked, issue with concentrating solar thermal is water use. As with traditional power plants, concentrating solar thermal power is using heat to make steam, and steam to turn turbines to generate electricity. In a 2011 post, ILSR noted that concentrating solar power used nearly twice as much water as a coal-­fired power plant if wet cooled, and nearly as much as a natural gas power plant even if dry cooled. Solar PV, on the other hand, uses no water to generate electricity because sunlight is converted directly into electric current. Over time, the cost parity of solar thermal electricity and solar PV disappeared, as the following chart shows. 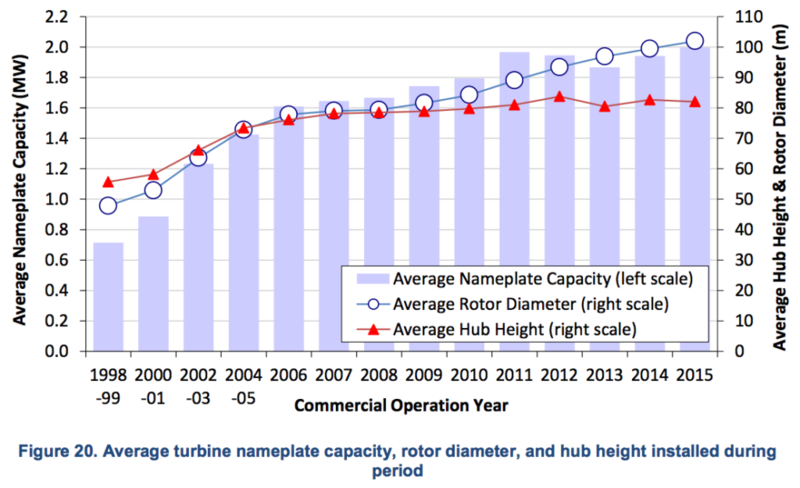 While PV costs have fallen rapidly, the cost of concentrating solar has not followed suit. The prospects for continued reduction in solar PV prices remain good, given impressively lower costs in Germany and Japan. At least half of the differences can be explained by the gap in deployment, with three times the amount of solar deployed in Germany and Japan relative to the U.S. Other differences include “installation labor; permitting, inspection, and interconnection; [and] customer acquisition,” according to the Rocky Mountain Institute. The availability of energy storage was (and is) another touted advantage of concentrating solar thermal, but it’s unclear that it can offset the significantly higher prices. Thermal storage at concentrating solar power plants is much cheaper per megawatt-­hour than batteries, and plants commonly have from three to six hours of storage. But since the thermal energy has to heat water and create steam, the response time from energy storage to useful electricity is in minutes rather than seconds. Early use of batteries, however, tend to be in providing “ancillary services,” such as maintaining a consistent voltage on the grid. These services require a relatively small amount of total capacity, but require a quick response. Shifting production from day to night has not proven economical. On the other hand, as the prevalence of solar PV in California is shifting the electricity peak into the later evening hours, thermal storage at concentrating solar plants could become more valuable. So far, however, the challenges and costs of concentrating solar thermal have spurred a shift toward solar PV, even for large projects, resolving the technology debate in favor of mass­-produced solar PV. The scale issue, however, remains a fight within the technology of solar PV. As mentioned in the introduction, the Brattle Group last year fired the latest salvo in the utility­-scale versus distributed solar debate. The group argues that resources should be disproportionately invested in utility­-scale PV, since it can produce electricity at half the cost of distributed PV. 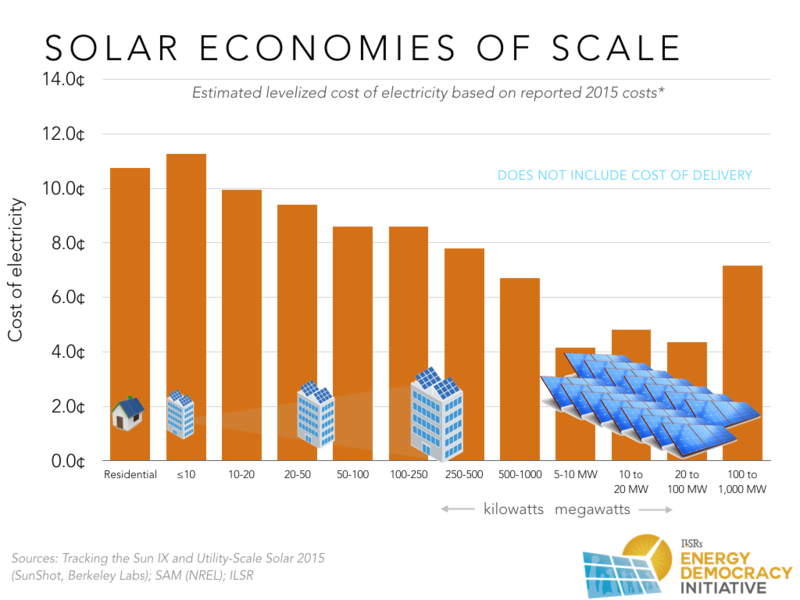 In a set of 2016 reports on solar, Berkeley Labs and the Department of Energy’s SunShot initiative provided data on distributed and utility­-scale solar costs. 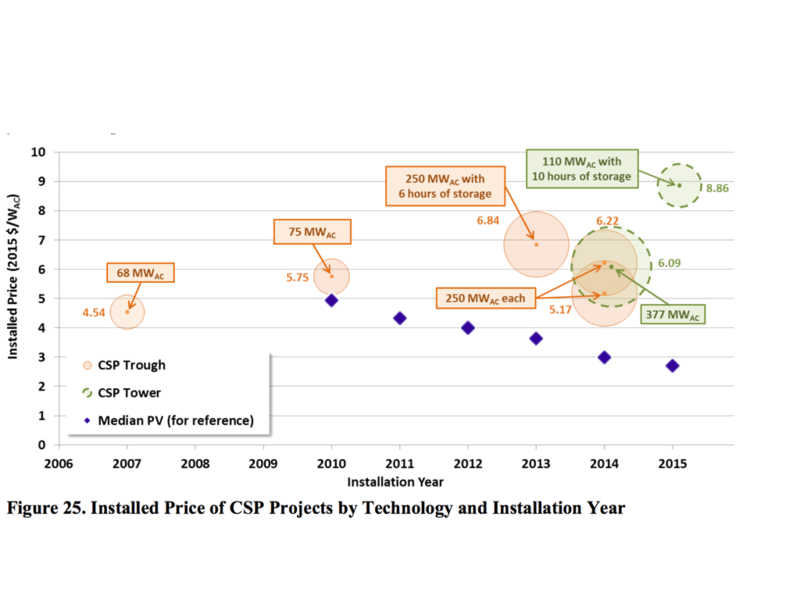 This chart combines the two analyses, and shows that the sweet spot for low­-cost solar development is in the middle, rather than at the ends of the size spectrum. In the chart of upfront costs above, the largest utility­-scale projects are nearly as costly as rooftop commercial­-scale solar projects. However, utility­-scale projects typically use panels that track the sun, with commensurately higher electricity output. The following chart, of the inflation­-adjusted levelized cost of electricity, offers a more accurate picture. We used the National Renewable Energy Laboratory’s System Advisor Model to generate a real, levelized cost of electricity for a $2.50 per Watt solar array of 6.71¢ per kilowatt­-hour (including the 30% higher federal tax credit), and adjusted accordingly for the other capital costs. Utility­-scale projects (those 5 megawatts and above) are assumed to have tracking, with 30% higher output and therefore 30% lower levelized energy costs. This chart seems to support the Brattle Group’s contention that bigger solar is better, aside from projects exceeding 100 megawatts. 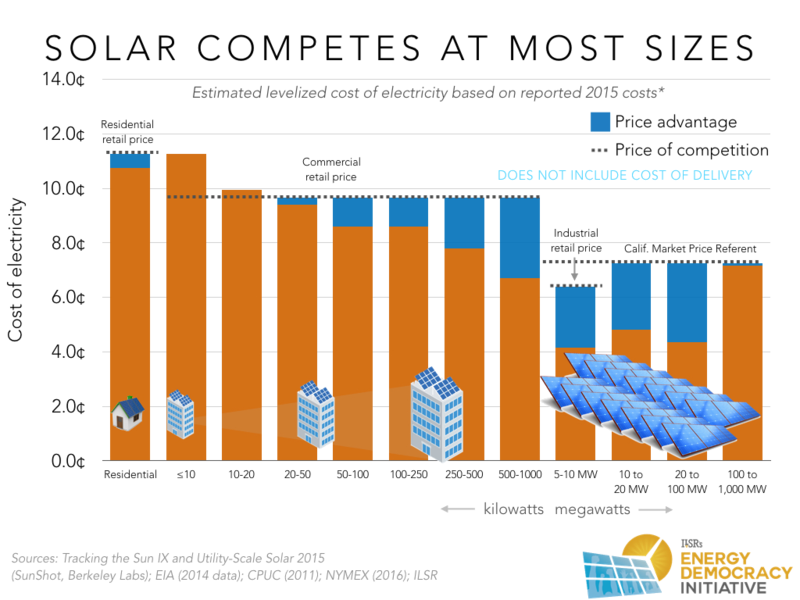 This chart shows that at most smaller sizes, solar favorably competes with the retail electricity price. The national average residential electricity price used for this chart is close to 12¢ per kilowatt-hour, but this price is 15¢ in California (and even higher in some states in the Northeast). Commercial scale solar also competes relatively well against average commercial retail electric prices of 10¢ per kilowatt-hour.4 Megawatt­-scale projects, connecting and competing into the wholesale market, compete against other new power generation, like natural gas, that produces electricity for 5¢ to 8¢ per kilowatt­-hour. Worthy of note, the rise of community solar projects looks to hit that sweet spot of cost and benefit, with projects typically between 250 and 1000 kilowatts, providing a cost­-effective way for those without a sunny rooftop (or enough capital to finance their own solar project), a way to participate. White solar at nearly any scale is competitive, the price of solar from large scale solar projects does not include the cost of transmission for delivery, relevant for most projects over 5 megawatts. Writ large, the cost of transmission is rising. 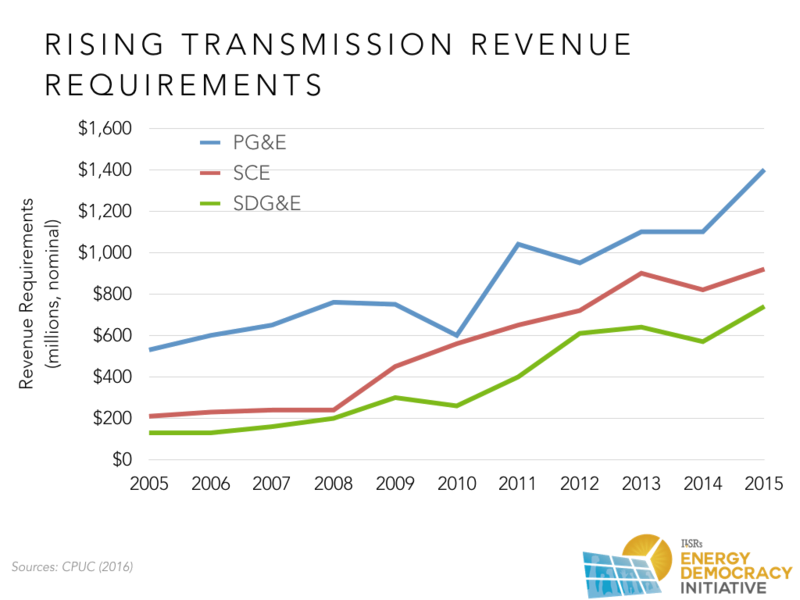 In California, transmission costs for the three major investor­-owned utilities have been rising by nearly 10% per year. A 2015 Energy Institute at Haas working paper, described here, performed a detailed analysis of Pacific Gas & Electric’s distribution grid and concluded that solar penetration equal to 100% of capacity on all circuits would require only small cost to accommodate [less than 1/1000th of a percent of the utility’s operations and maintenance budget]. San Diego Gas & Electric (SDG&E) has estimated that their grid can accommodate about 1,000 Megawatts of distributed generation. That’s equal to around 20% of the utility’s peak demand. So big solar projects might produce somewhat cheaper electricity, but unlike your Amazon Prime membership, there’s no free delivery. 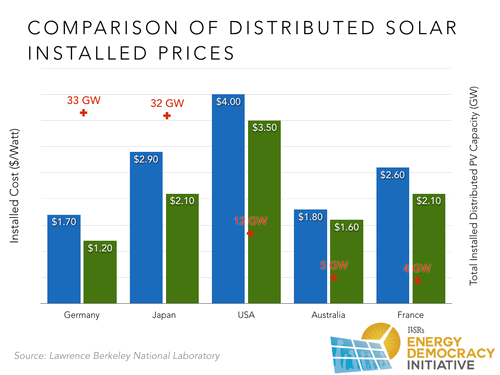 And comparing utility­-scale and distributed­-scale solar misses an important point: they do not compete with each other on price. A final contention in the size debate is whether, driven by the urgency of climate change, it is possible to most quickly deploy wind and solar in small chunks or big ones. Although we can’t definitively answer this question, we offer two powerful anecdotes that suggest that big changes in renewable energy deployment come in packages of any size. Prior to 2007, Germany had installed about 2,900 megawatts of solar. Prior to 2011, the U.S. had installed a similar amount. Over the next five years, Germany installed 22 gigawatts of solar, 75% of projects smaller than 500 kilowatts. In a similar timeframe, 2011-2015, the United States installed over 23 gigawatts of solar capacity, with just 42% smaller than 1 megawatt. 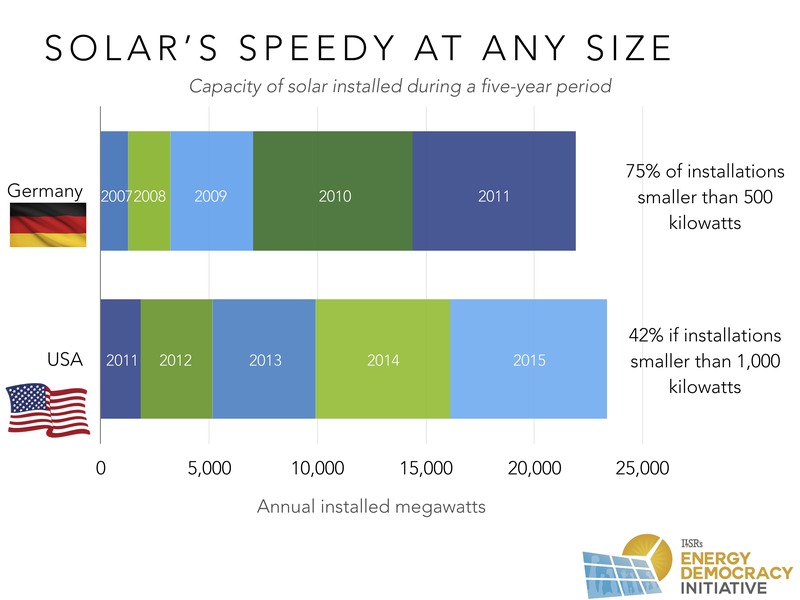 In other words, in scaling up solar, the size (of individual projects) didn’t matter. While the total capacity was similar, Germany’s focus on local ownership meant that much more of the economic benefit of its new solar capacity accrued to ordinary citizens, instead of incumbent utilities. In Denmark, electricity had long been the province of cooperatives, so when the “feed-in tariff” program offered a guaranteed grid connection and a fair price on a 20-year contract for wind power in the early 1990s, many Danish citizens became part of wind power cooperatives. Wind energy capacity surged from around 500 megawatts to over 3,000 megawatts, and 80% of this wind energy was owned by 150,000 Danish citizens (3% of the population). On a per-capita basis, this would be the same as adding 150,000 megawatts of wind power in the U.S. (twice the total installed capacity at the end of 2015). In the Danish example, wind power grew much faster when connected to local ownership, even though typical projects were just 3 to 7 turbines, each about 500 kilowatts in size. Despite an American fascination with big things, the key to unlocking renewable energy is found in small packages as well as big ones. And one key to understanding the debate is to understand the players, with incumbent utility companies (and their incentive to build big things to make money) playing an outsize role in the debate over the right size of wind and solar. Utilities are profoundly aware of the cost shift enabled by smart technology, distributed solar, and local ownership. For nearly 100 years, electric utilities have enjoyed protected status as regulated monopolies. 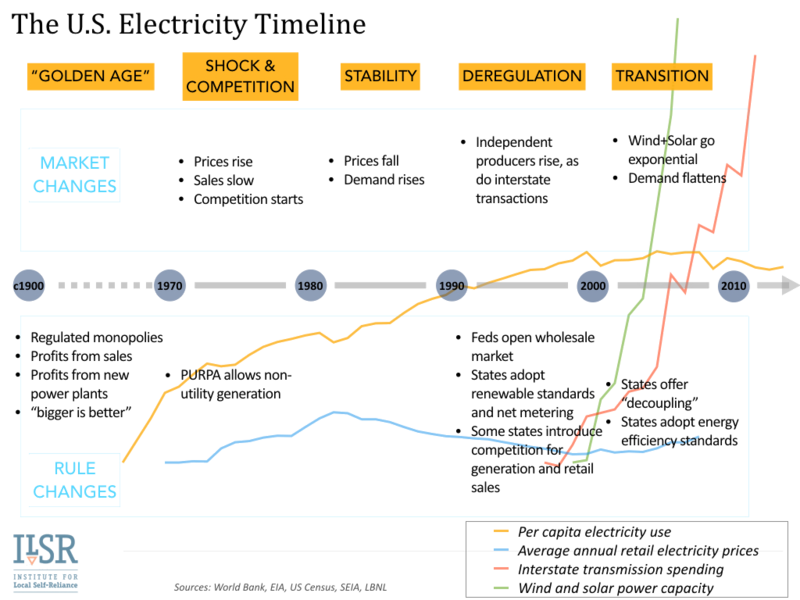 While regulators have changed some elements of the market, explained in the chart below, most utilities still rely on increasing sales of electricity and the capital deployed for new power plants for their revenue and profits. The economies of scale debate isn’t so much about the cost of power (generation) as it is who retains the power (of ownership) over the electricity system. If the utility owns large­-scale solar and wind projects or buys power from big ones, it will still need to deploy capital to bolster the transmission system (and earn a return on that investment). But if trends continue, and electric customers instead reduce their purchases with efficiency and by producing their own electricity (e.g. with rooftop solar), the old model falls apart. The utility response to this trend shows they understand this fear of business failure. The Brattle Group’s 2015 study exhorting the benefits of utility­-scaled solar was financed by the Edison Electric Institute, the trade organization representing investor­-owned utility companies. A 2013 study from Edison noted that competition from customer­-owned distributed solar was an existential threat to their business model, and a 2014 report from Berkeley Labs confirms this fear: more solar won’t be bad for customers, but it could be really bad for utility shareholders. The graphic below is from the report and annotations were done by ILSR. 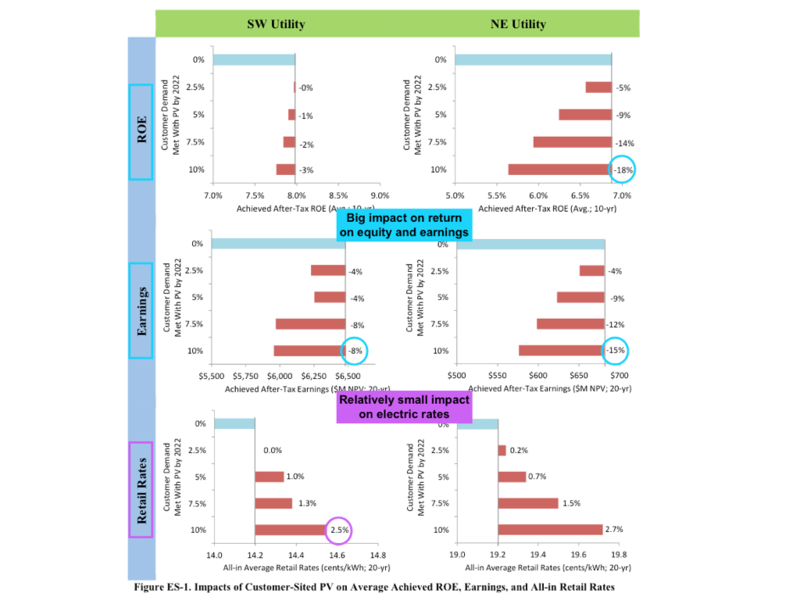 The top row of charts shows that as customers supply more solar PV, utility return on equity falls sharply for the hypothetical Northeast utility, in particular (by 18% when solar provides 10% of electricity). Earnings, shown in the next row of charts, also fall by 8% for the hypothetical Southwest utility and 15% for the Northeast utility when solar provides 10% of the utility’s electric needs. In contrast, the last row of charts shows that the impact on customers to be relatively small, with rates rising less than 3%. 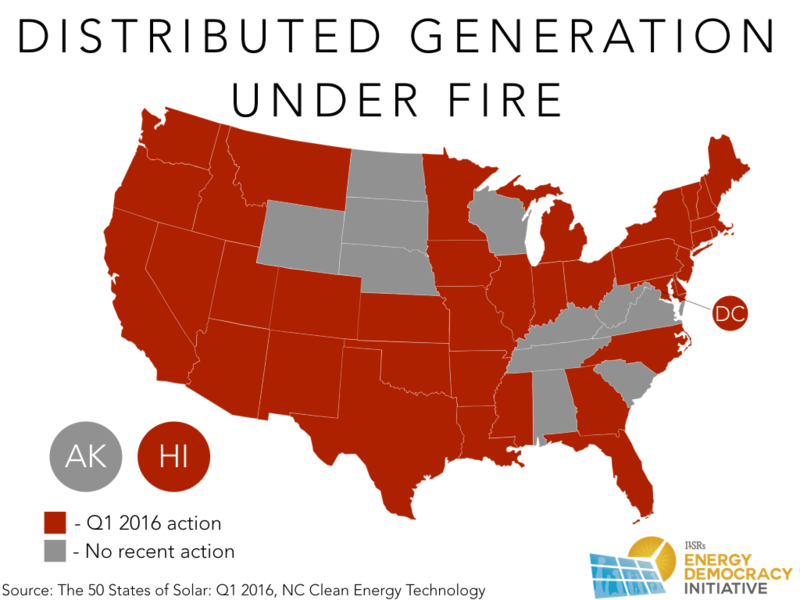 The relative costs of distributed solar to the customer versus the shareholder help explain the political landscape for solar, where utilities are fighting rearguard actions against net metering and other policies that support distributed solar across the country. The poor outlook also explains why utilities are trying to change the language of renewable energy, to favor their continued control and ownership. In their Orwellian newspeak, rooftop solar becomes “private solar,” in contrast to “universal solar” that utilities will own and control. In a 100% renewable energy future, there’s room for big, utility­-scale wind and solar and distributed renewables, too. 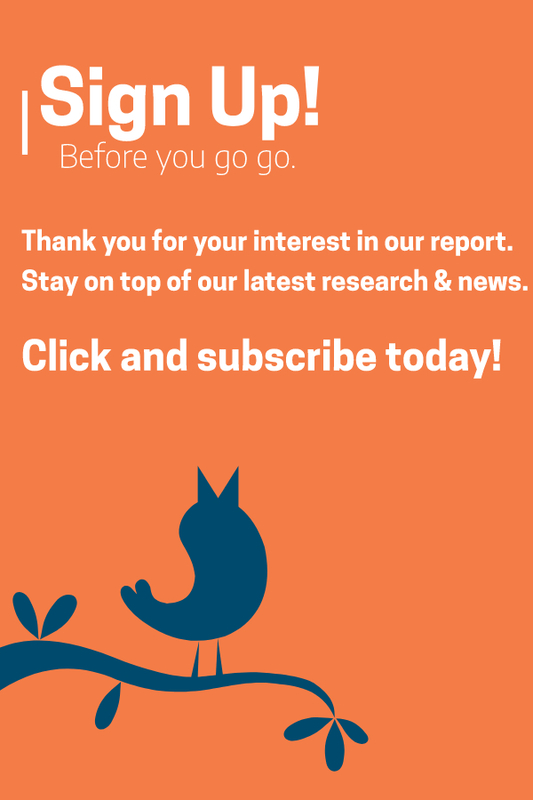 Understanding the relative cost of our investments matters, because resources are limited. But understanding the relative benefits (and the recipients) matters, because making the transition doesn’t require us to remain married to a century­-old and increasingly archaic business model. The economic arguments between big and small can’t be taken at face value, because the largest players have a vested (dare I say oversized?) interest in the outcome. Can scale economies generate cheaper electricity? Sometimes. But smaller renewable energy systems can also compete at the retail level, where their relative benefit (and the costs they offset) is also higher. The choice between big and small is more than a spreadsheet analysis. 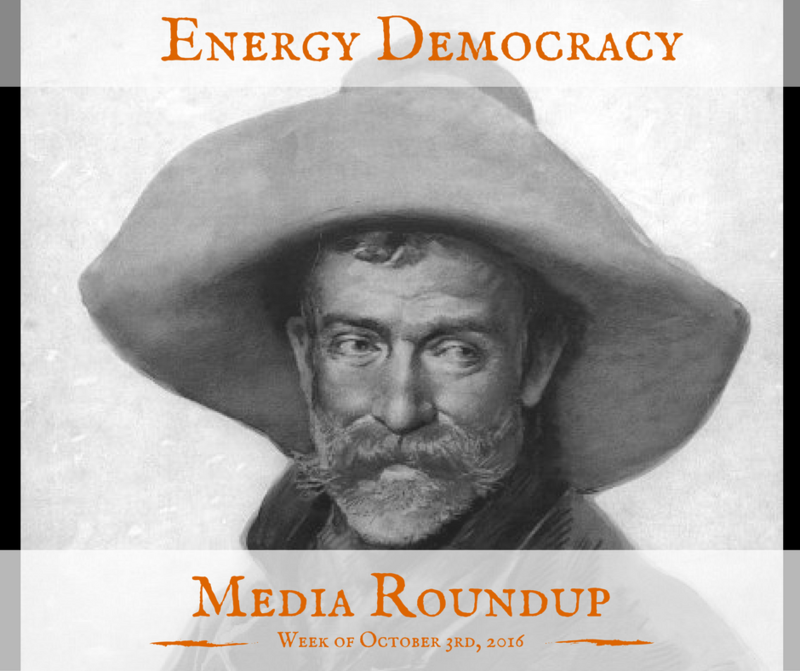 Instead, it’s an argument about whether the economic windfall of the renewable energy transition will accrue to the incumbent players or whether tapping the wind and sun in communities across America will result in benefits everyone can share.